Knit By God's Hand: Doubt? Faith! 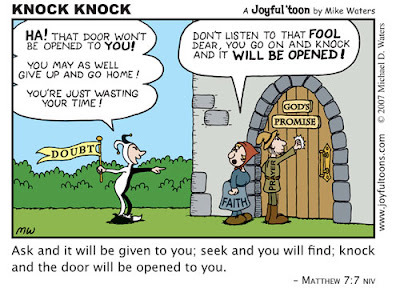 How many times have we been at that door of "God's Promises" & that sneaky guy of DOUBT is standing there whispering to us that its not worth it - that door wont be opened for us! I love how this represents that FAITH's voice is stronger & right up to the ear of this guy! And he's listening because he's still knocking!!! When you are at the door - are you still knocking? Or are you giving up & walking away? Ouch! This struck a nerve with me today. Thank you for this!!! I am going to share this with my daughter. I haven't knocked for a long time. It's hard to say if I keep knocking or walk away. Thanks for the reminder to ignore the little voice. I try to keep knocking but sometimes I'll admit I walk away. Stress gets the best of me and can alter my faith sometimes! Awesome post! Love the cartoon...where did you find that? That's a good reminder! Thanks!